With the launch of door-to-door data collection, Rwanda—the 13th country to join the multi-country Population-based HIV Impact Assessment (PHIA) Project led by ICAP at Columbia University—is poised to take an important step forward in understanding and addressing its HIV epidemic. 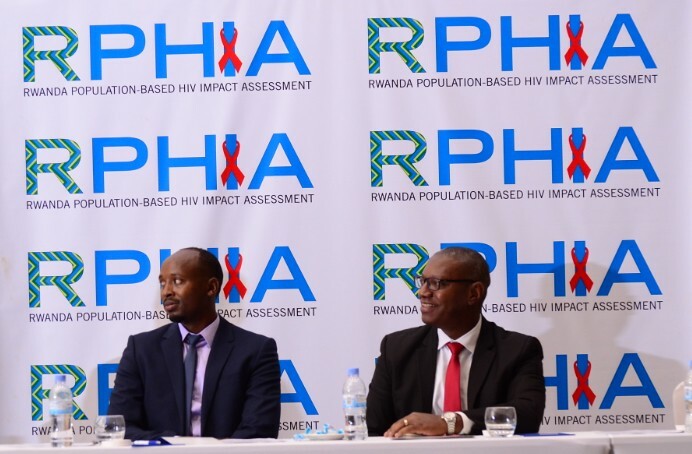 The PHIA survey in Rwanda, called RPHIA, will survey approximately 10,800 households covering 30,000 people between the ages of 10 and 64 years, in order to measure the country’s progress toward epidemic control based on HIV prevalence, incidence, and viral load suppression. RPHIA is the first large-scale survey to provide home-based counseling and testing with same-day return of results for HIV and hepatitis B in the country. The nationwide effort to collect these critical data is led by the Ministry of Health through the Rwanda Biomedical Centre, and the Ministry of Economic Planning and Finance through the National Institute of Statistics of Rwanda. The project officially kicked off on October 10, 2018, at an event in Kigali, the nation’s capital. Among the organizations represented were ICAP and the U.S. Centers for Disease Control and Prevention (CDC), which works in partnership with ICAP on the PHIA Project with funding from the U.S. President’s Emergency Plan for AIDS Relief (PEPFAR). The launch in Rwanda means 13 out of 14 countries participating in the PHIA Project have started surveys since 2016, with 10 having already announced results. Summary sheets, initial reports, and full reports of PHIA surveys are available on the project website. PHIA surveys provide essential information on the reach and impact of a country’s HIV prevention, care, and treatment services by reporting on the three markers of the Joint United Nations Programme on HIV/AIDS (UNAIDS) 90-90-90 targets: the percentage of people with HIV who know their status, the percentage of people who know their status and are on antiretroviral therapy (ART), and the percentage of people on ART whose viral load is suppressed. Viral load suppression indicates that ART treatment is effective, which is beneficial both for the health of people with HIV and for others, because those with a suppressed viral load cannot transmit the virus. According to the UNAIDS mathematical models, achieving 90 percent in all three categories by 2020 and sustaining this achievement until 2030 should result in a reduction of HIV transmission sufficient to reach epidemic control. With guidance from PHIA results, each surveyed country is planning policies and programs to target HIV testing, to help people diagnosed with HIV access and adhere to treatment regimens, and to provide resources to those individuals whose treatment has not resulted in viral load suppression. During PHIA surveys, trained personnel visit randomly selected households and collect information from each person in the household, including children, in order to achieve a representative population sample. Staff conduct HIV testing and, in some countries, hepatitis B and C testing as well. HIV results are returned to participants on the same day, and viral load test results are sent to a health care facility that the participant chooses. Participants who test positive for HIV are referred to health facilities of their choice for follow-up care, including further HIV counseling and treatment. ICAP’s 15-year history of meaningful partnership in the countries hardest hit by the HIV epidemic provides the foundation for its successful implementation of the PHIA surveys. Working with all levels of the health care system, from national leadership to local health facilities and community health workers, ICAP has built trusted relationships and a reputation for excellence that literally open doors. When people receive a knock on their door from PHIA survey staff, they know they are contributing to the health and wellbeing of their entire country.